Tenby is a town that is literally dripping with history, still enclosed in part by the medieval stone wall that protected it in centuries past. Though the town that those walls protect may have changed and adapted to the passage of time it has remained a popular leisure destination for almost two hundred years. Such a long career in the hospitality and tourism industry means that the town knows what its visitors want and expect from Tenby as a holiday destination. Visitors here will not be disappointed by what they find either as they will discover an ancient medieval heart to the town which is surrounded by three award winning, blue flag beaches. Whether you are looking for a relaxing weekend break filled with pampering and all things luxury, or an adrenalin packed adventure filled week in the great outdoors, Tenby has just what you are looking for. Located in Pembrokeshire, the region offers plenty of attractions and activities for all members of the family. There are activities for the adventure lovers such as paragliding into Tenby Harbour, which will give you a totally unique view of the region, or a Jet Ski Safari around the coastline, or you could even try your hand at kite surfing along the broad expanse of sand at South Beach. Of course it’s not all about adrenalin fuelled activities though as there are always opportunities for relaxation and even a spot of pampering to be found if that is what you really want. There are a wide variety of restaurants and eateries in the town that can cater for just about every taste and every budget, the majority of which serve only the very best in locally grown produce, there is also a vibrant nightlife that would be just as at home in the city as it is here. 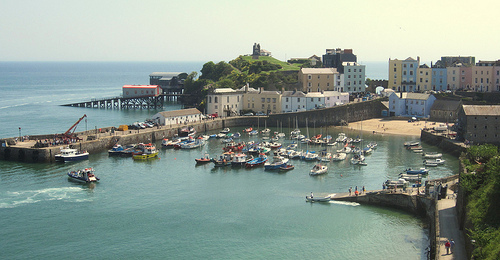 Tenby is a destination for those looking to party as well as those looking to enjoy a relaxing weekend, plus all of this activity is within easy reach of some of the regions historical sites and other attractions. Folly Farm has much more to it than the name suggests, as you would expect there is of course a farmyard filled with friendly animals, but also bundled in with the farmyard fun is a fabulous zoo, an impressively large vintage style funfair plus loads of adventure play areas for the kids to burn off all of that excess energy. The farmyard is probably the most popular attraction here because at Jolly Farm visitors can get up close to all kinds of farmyard animals, and if you time your visit right, their babies. There are a good variety of animals from hens to horses and there are many opportunities to feed and pet the animals too, all the while being entertained by the larger than life characters of Folly Farm which roam around the venue. Parents will enjoy the vintage funfair and the zoo is appealing to just about everyone, so have fun.